Info "All's fair in love, war and ice hockey. Run the other team off the ice!" 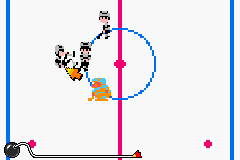 Ice Hockey is one of 9-Volt's microgames in WarioWare: Twisted! It is set in the NES game of the same name. The object is to run the other team off the ice rink. Level 1: Knock-off two players that are hardly moving. Level 2: Knock-off two players that are circling around. Level 3: Knock-off three players that are circling around.